Video games have been known to increase the levels of player’s motivation. 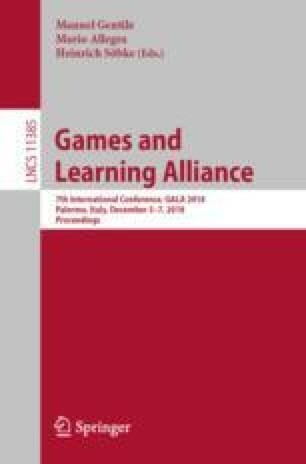 This initiated the emergence of serious games and gamification to exploit game elements and mechanics for increasing the motivation in non-game contexts. The research reported in this paper used psychological theories of Self-Determination Theory (SDT) and Self-Efficacy Theory (SET) to design three versions of a game. The first version was based on SDT, the second on SET and the third version was based on a combination of these two theories. The objective is to investigate the impact of each game design on the user motivation and performance. An experiment of playing the games designed with these features was conducted. Surprisingly, the results on the objective evaluation revealed that there is no significant difference among the groups in terms of engagement and performance. Furthermore, these findings were confirmed by the results on the subjective evaluation of player’s perceived motivation, which showed no significant difference between the three experimental conditions. This research has been conducted with the financial support of the European Union through the Beaconing project (Horizon 2020-Grant Number 687676). The authors acknowledge the financial support of the EU, Hands-Free Computing Ltd and the National Council of Science and Technology of Mexico (CONACYT).